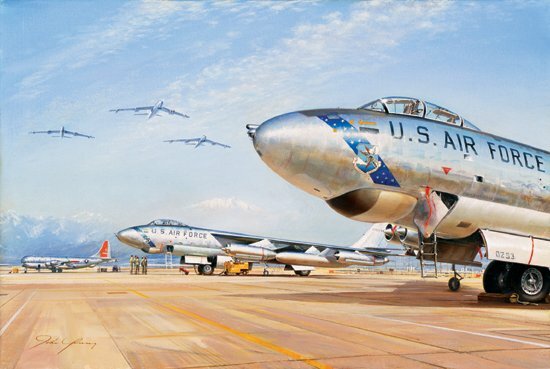 Paper Size: 29" x 22.5"
Plane Type: Boeing B-47 "Stratojet"
The B-47 became the first true modern bomber to fill the ranks of General Curtiss Lemay’s new Strategic Air Command. With long range, high altitude capabilities, the “Stratojet” became the backbone of SAC in the early 1950s. As fast as many early jet fighters, with sophisticated defenses and an operational altitude of up to 40,000 feet, the B-47 was a strong deterent in the early days of the nuclear standoff. Personally autographed by B-47 test pilot A. M. “Tex” Johnston.